‘The Bank Heist’ is a spectacular show which seems to make audiences stop in their tracks! Two criminal masterminds chaotically clown, flip and cling for dear life as they scale down the height of the venue. Clowning, aerial acrobatics and wall-running combine as they frantically spill the contents of their swag in farcical slow motion. As they reach the bottom, they strip down to their garish ‘incognito’ costume and perform a fast, physical, quirky comical dance duet as they attempt to make their escape out into the crowd. 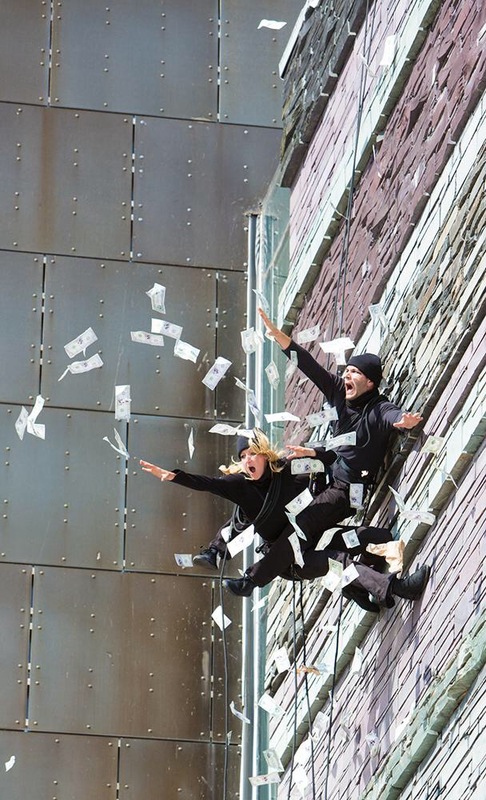 ‘The Bank Heist’ is a 12-minute spectacle of a show originally commissioned for Blysh Festival 2014. The piece was originally performed scaling down the walls of the Wales Millennium Centre, Cardiff with mentoring from Le Navet Bete, receiving fantastic responses. The show is now touring! If you are interested in booking and would like a promoter pack, please contact Chloe Loftus for more details.